Paul Pogba has given Manchester United an early 1-0 lead against Leicester City in their Premier League opener this evening. The France international, fresh from winning the World Cup in the summer, is back in action for his club and has returned with a bang. Named captain for the night, Pogba didn’t take long to get on the score sheet, coolly putting away a penalty for United in the second minute. 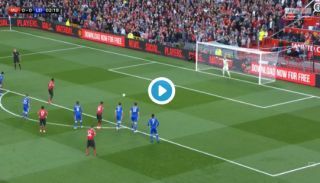 WATCH: Paul Pogba scores the opening goal of the 2018-19 Premier League season from the penalty spot!